Public art is not an art "form." Its size can be huge or small. It can tower fifty feet high or call attention to the paving beneath your feet. Its shape can be abstract or realistic (or both), and it may be cast, carved, built, assembled, or painted. It can be site-specific or stand in contrast to its surroundings. What distinguishes public art is the unique association of how it is made, where it is, and what it means. Public art can express community values, enhance our environment, transform a landscape, heighten our awareness, or question our assumptions. Placed in public sites, this art is there for everyone, a form of collective community expression. Public art is a reflection of how we see the world—the artist's response to our time and place combined with our own sense of who we are. 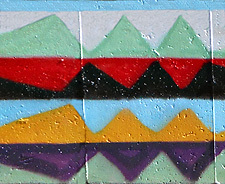 This image shows a section of the mural surrounding the Cultural Intrigue building, its loading docks and parking area. American conceptual artist Scot Borofsky, now 57, was brought up in Brattleboro. He ascribes his interest in creating public art to the influence of his Vermont roots, particularly the counter-cultural social and political movements emerging during his youth in the 1960s and '70s. He studied at Interlochen Arts Academy (1973-75), Brandeis University (1975-78), and Rhode Island School of Design (1978-81), and then received a Max Beckmann Memorial Painting Scholarship at the Brooklyn Museum in 1981-82. Borofsky began traveling in Latin America during winters after finishing art school, simultaneously building his career in New York City during summers into the mid-1990s. First represented in New York by the Mokotoff Gallery in 1984-88, Borofsky has been shown in many venues in New York City and in New England. His work is in the collections of the Metropolitan Museum of Art and The Pierpont Morgan Library in New York City, as well as the Brooklyn Museum, the Museum of Oaxaca (Mexico), and in many private collections. He has also been featured in Art In America, Artforum, Arts Magazine, Art News, The New York Times, and many other widely distributed publications. Never content to focus only on studio work, Borofsky was equally drawn to creating more public statements of artistic expression. As one of the first "Street Artists" in New York's East Village in the 1980s, he created the Pattern Walk, a group of over twenty spray-paint murals in a one-block area of "Alphabet City." Borofsky's work draws from the pictographic languages and patterns invented by ancient civilizations, and it influenced early New Age cultural graphic symbolism. This language of personal symbols, interspersed with invented patterns—all based on early human examples of the same—comprises the content of his early outdoor spray-painted works. 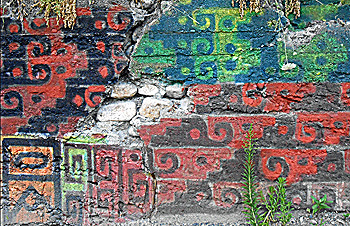 This mural section on an older wall looks almost like it's from an ancient archaeological site. Borofsky recently completed four years of work—another large outdoor installation of paintings—in his hometown. 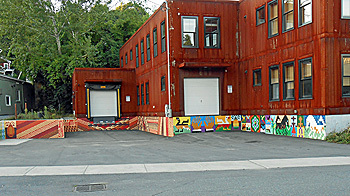 The "Brattleboro Pattern Project," begun in the Spring of 2012 and finished in September 2015, includes a mural surrounding the parking lot and loading dock of the Cultural Intrigue building on Frost Street (near the corner of Elm & Flat), and surrounds the base of the entire building itself. 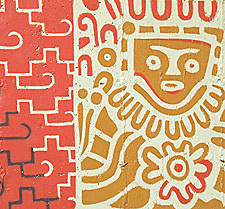 This extended mural of traditional Native American patterns quotes weaving, architecture, and ceramic decoration from ancient and contemporary sources spanning from the Northwest Pacific Coast to Central South America. Some of the source materials for this work are textiles acquired during the artist's years of travel in Latin America. 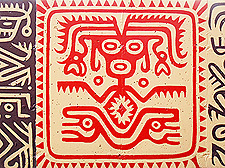 Some designs are from historic objects and from the artist's collection of archaeological books. The entire work, viewed as an installation, makes a direct reference to the historical ruins of Mitla, a Pre-Columbian archaeological site near the city of Oaxaca, Mexico, the most intense example of ancient architectural patterning in the Americas. 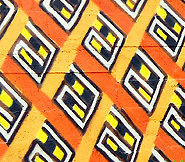 In all, Borofsky has created twenty different pattern paintings on private and public walls throughout the downtown Brattleboro area, including pattern examples taken from the artistic traditions of Africa, Scandinavia, Turkey, China, Japan, and India. A pamphlet-map of the pattern pieces has been prepared to assist folks in locating and understanding the work while moving throughout downtown Brattleboro. Gallery Walk weekend in November features several events celebrating Borofsky's public art accomplishments in both New York City and Brattleboro. These events are an opportunity for area residents to familiarize themselves with the work Borofsky has created locally and how it relates to his earlier expressions of public art. Public art ephemera will be available at all these events in exchange for small donations to benefit downtown art in Brattleboro. FILMS AT THE RIVER GARDEN, 157 Main St., Friday, November 6, 2:30-4:00 p.m.: Three films documenting Borofsky's Manhattan Street Art in the early 1980s will each be introduced by the artist, who will take questions following the screenings. Admission is free, but donations to support public art in Brattleboro are welcome. Titles include "King on Throne," 1984, by Phillipe Bounous; "The Harlequin and The Supplicant," 1986, by Jeff Perry; and "FA-Q Gets a Haircut," 1982, by artist/filmmaker/gallerist Jim C. These classic East Village films document the neighborhood and time period as much as they do Borofsky's activities." RECEPTION AT THE LATCHIS GALLERY, 50 Main St., Friday, November 6, 5:30-8:30 p.m.: November's multi-media installation in the gallery features paintings, photographs, and films. Works on paper used for creating outdoor artworks in the downtown will also be shown and offered for sale in a Silent Auction, with all proceeds going to benefit public art projects in downtown Brattleboro. GALLERY WALK OPEN HOUSE, Barber Building Lobby, 68 Main St., November 6, 5:30-8:30 p.m.: The public is welcome to stop by and view Borofsky murals and other restoration projects in this space. The original painting "The Story of Fresh Water," which inspired one of the two murals, is included as part of the Latchis Gallery installation. 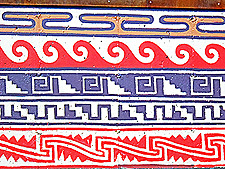 OUTDOOR RECEPTION, Cultural Intrigue, 35 Frost St., Saturday, November 7, 1:00 p.m., followed by a Drum Circle from 2:00 p.m. till dark: The parking area at Cultural Intrigue will host a celebration for completion of Scot Borofsky's "New England Mitla," a series of paintings surrounding the base of the large building and parking area. This collection of Pre-Columbian patterns and designs was inspired by the artist's collection of Native American weavings and belts, and by the ancient Mitla ruins near Oaxaca in Southern Mexico.... Bring your drum and something to sit on to participate in the open drum circle. OPEN STUDIO, Scot Borofsky's Studio #226A, Cotton Mill Hill, Sunday, November 8, 10:00 a.m. to 6:00 p.m.: A wide variety of works on canvas and paper, spanning the artist's career, will be on display for the curious and for the collector. Visitors will see the artist's studio-based work where iconography of his symbols takes on new forms and opens different doors in the psyche. Follow signs to the second-floor studio from the North Entrance. Call Scot at 802-579-2507 with any questions. For more info, visit scotsart.com or email scotsart@gmail.com.